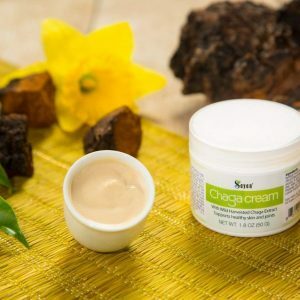 Popular in Asian medicine for thousands of years, chaga or the “Gift from God” has become a notable name in holistic health circles for the last few decades. This wild-harvested birch tree fungus is packed with a variety of exceptional bioactive ingredients, minerals, and essential vitamins. 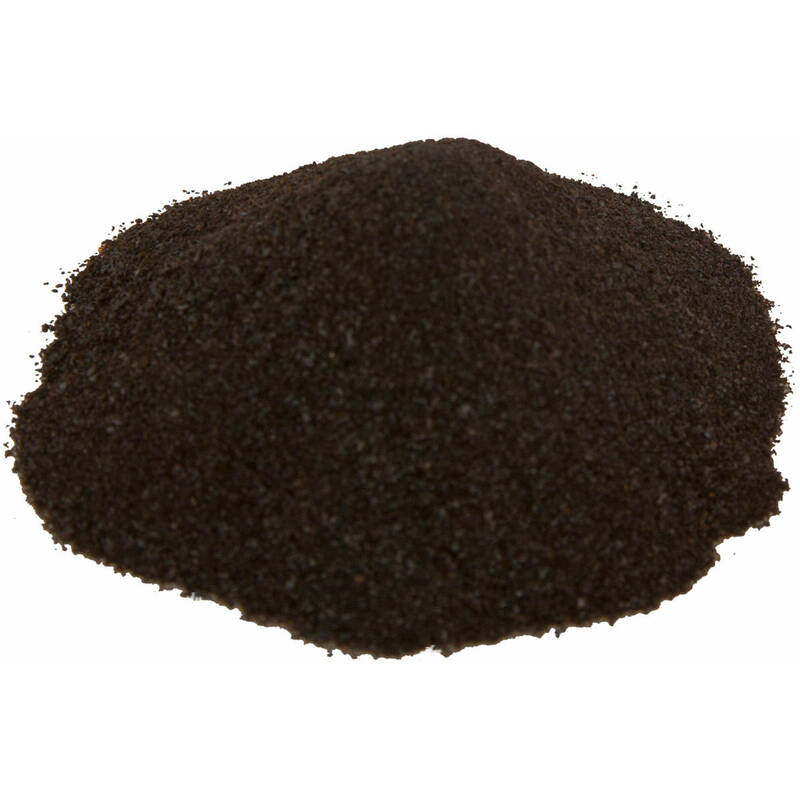 Just as ancient and venerated in medicine texts, specifically the Ayurveda (the traditional medicinal system of India), shilajit is a special, tar-like substance found in the mountains. Sometimes known as mumio, shilajit is formed after organic matter dies and mixes with metabolites and minerals from soil, water, and other sources. After a fermentation period, the shilajit is drawn out by the sun’s heat, ready for harvest. 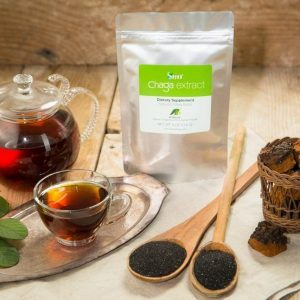 More than just doubling the benefits, we’ve fused our potent chaga extract with pure shilajit powder to develop the pleasant taste. On its own, shilajit does not suit everyone’s pallet but when it blended with chaga extract, the mixture tastes as great as it makes you feel. We also make it easy to get your shilajit and chaga daily. 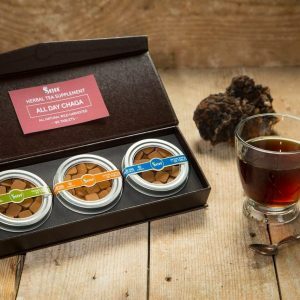 While shilajit requires being dissolved in water and raw chaga mushroom needs to be brewed, our superior product is ready to use. Simply mix our product with any liquid, hot or cold, for an instant, tasty beverage. Sayan shilajit powder begins its journey when we scrape it from the rocks in the Altai Mountains.Once we have the natural product in our facility, we start the refining process using water extraction to distill pure shilajit from its raw state. The extracted solution is filtered and evaporated in a vacuum at 60-62 degrees Celsius until it achieves the concentration of 15-20%. The obtained product is kept at the same temperature for 40-60 minutes while it continues to purify via natural sorbents. One of the following sorbents is typically used for this step: calcium carbonate, a mixture of calcium carbonate and calcium hydroxide, or a mixture of calcium carbonate, calcium hydroxide and silica gel. The refining process is completed by drying the purified mass at a temperature not exceeding 60 degrees Celsius. 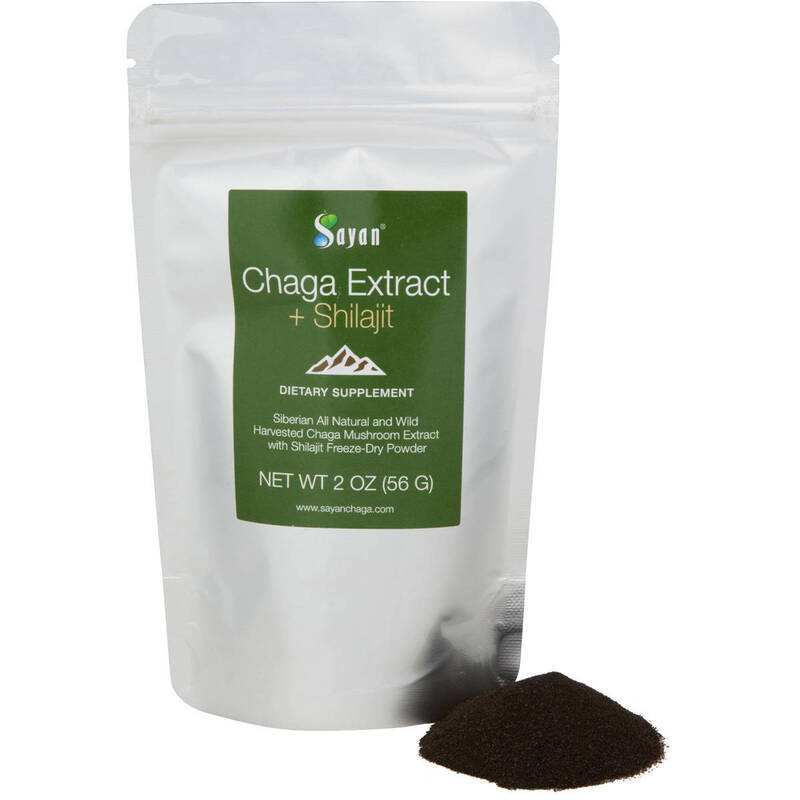 After purification, the shilajit is mixed with chaga extract, using our proprietary blending process. Then the final concoction is freeze dried to ensure our product is optimized with the most essential nutrients. 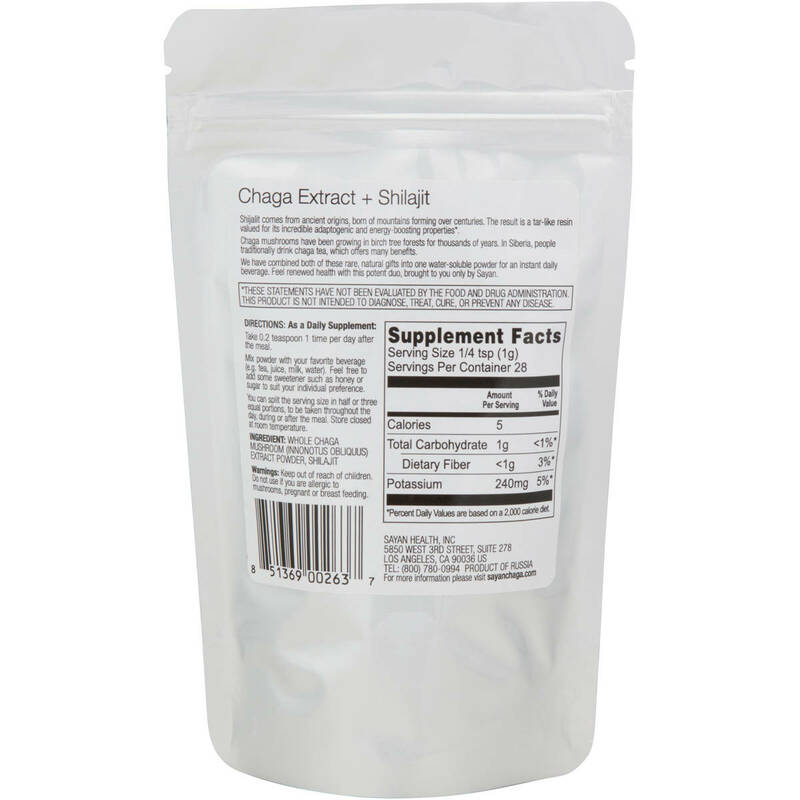 Our hard work results in a product that packs the most potent chaga available and 20% more concentrated shilajit than you’d find in its raw form. This ready to use product is free of bacteria, microorganisms, and other decomposition byproducts that may contain harmful toxins. At Sayan, we are dedicated to offering you unique, premium products, direct from the Siberian forests and Altai Mountains, untouched by human civilization. Hidden away in a land as pure as the driven snow, we carefully gather these gifts of nature to process them into a product you can easily use and enjoy every day. We also provide fast international shipping and unparalleled customer service, making us your go-to source for excellent, holistic health. 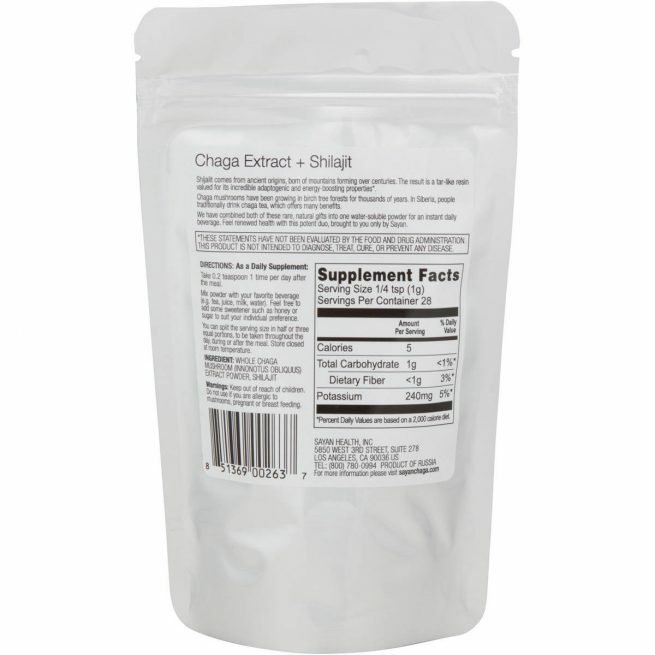 Ingredients: Chaga extract powder and shilajit powder. Directions: Recommended use is to add 1 gram of powder mixture per day to hot water or any other beverage (cold or hot) of your choice. Add honey or stevia to sweeten if necessary. Mild taste and easy to drink with healthy benefits! This product has energized my life truly, amazing natural product. The taste is mild but I love the wonderful health benefits. 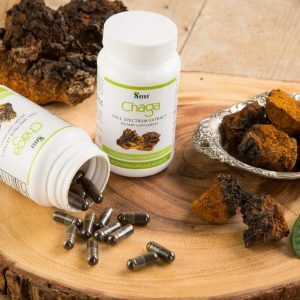 Sayan Health is the best company to purchase great quality chaga. I would order this again. Love this stuff. It improves my mood and concentration. I use to mix it in morning coffee.. it can interfere with your sleep if taken later in the day! I feel very stronger and active..
Not tested this product thoroughly… So far I have found the taste is amazing and my energy level appears to be higher than before ingesting this product. Thank You for such an amazing product ! Chiro introduced me to this product so far convinced it has helped me with energy’and some of inflammation in my body. 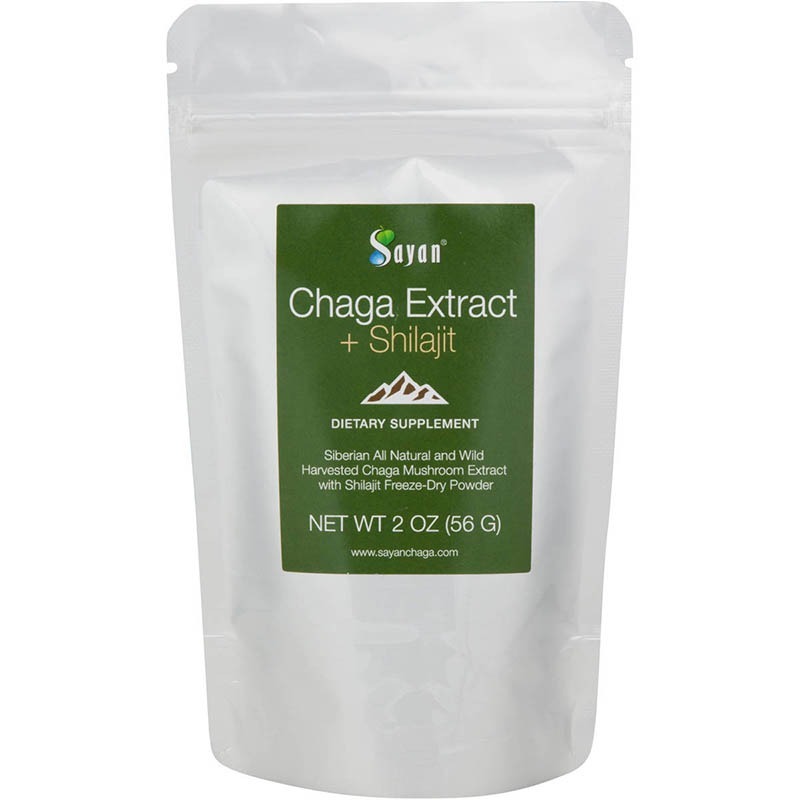 I feel the noticeable difference if I miss chaga supplements for any reason. My alertness and physical strength has doubled in a week since I’ve started taking this. I am feeling more energetic, lively and happy intrinsically and most importantly stopped napping during the day which was very much difficult for me earlier. I am extremely surprised. I have been using various products like this over the years and lost all hopes of expecting something good or more natural for my overall health and energy levels. But this one proved me completely wrong. I don’t get that gross sweaty feeling that coffee gives me, I feel cleaner overall. What is the effect on blood pressure? Is it increase the blood pressure? It doesn’t increase or decrease blood pressure. 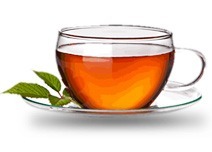 Many our customers reported that it actually helps to stabilize blood pressure. I love to mix the extract into my morning juice or afternoon smoothie, without any lumps it blends perfectly…and the taste is super divine! I feel really good starting my day out or getting that afternoon pick-me-up from it.” Everyone around me are extremely happy to see me energetic.